At the age of 11, Johnny Sylvester was seriously injured after falling off a horse and being accidentally kicked in the head by his mount. The youngster’s story made its way to the Yankees and shortly before October 6, 1926, Babe Ruth and the Yanks sent a signed and inscribed baseball to Little Johnny, who was hospitalized near his home in Essex Falls, New Jersey. Learning of the incident and Sylvester’s devotion to the Yankees, the team sent Sylvester this baseball from St. Louis, where they were playing the Cardinals in the 1926 World Series. The “Bambino” himself, Babe Ruth, signed the sweet spot of this red-and-black stitched “Spalding” manufactured ONL baseball. The signature is done in period black fountain ink and in our opinion rates a 6-7. “Babe” appears in quotes which is typical of Ruth’s signatures during the prime of his career. On the east panel is the famous prophetic inscription, “I’ll knock a homer for Wednesday’s game”, also in black fountain ink. The immortal promise was fulfilled by Ruth in Game 4 of the 1926 World Series where he hit not one, not two, but three home runs in a 10-5 routing of the Cardinals. It was the first time Ruth had ever belted three in a game, and in so doing, he became first player to do so in a World Series. The Babe’s historic feat spurred a miraculous turnaround in Little Johnny’s health; newspapers around the country ran stories of the boy being “cured” by Ruth’s home runs and Johnny quickly became the most famous little boy in America. In a New York Times article dated October 8, 1926, the boy’s doctor was quoted as saying that Johnny’s recovery began “when he learned the news of the Babe’s three home runs. His fever began to abate at once.” Ruth penned a letter to “his sick little pal” on October 9, 1926 (Game 6) saying that he hoped the boy was “well on the road to recovery” and that he would try and knock him “another homer maybe two today”. Ruth did, in fact, hit another home run the following day in Game 7. (This letter from Ruth to Sylvester as well as an additional letter are available in Lot #’s 2 and 3 of this auction). The Yankees would have been traveling from St. Louis back to the Bronx on October 8; Ruth may have intended to see Sylvester in New Jersey on his way to New York but his visit would be delayed until October 11, the day after the ‘26 World Series ended. 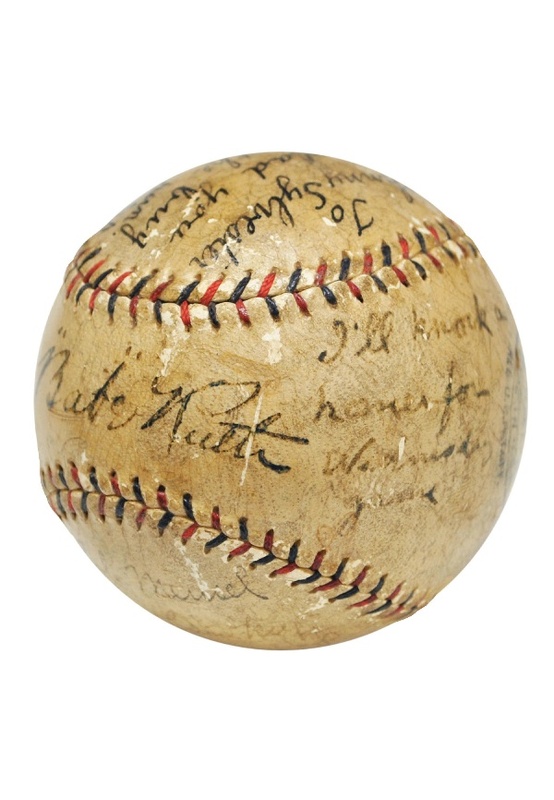 On the north panel of this iconic baseball is a message from the Yankees, “To Johnny Sylvester, ~We’re glad you knocked the bug for a home-run. The Yanks”. The inscription is penned in bold black fountain ink. The south panel features the signatures of five of Ruth’s Yankee teammates: Bob Meusel, Bob Shawkey, Herb Pennock, Mark Koenig and Pat Collins. The five signatures are done in black fountain ink and in our opinion rate a 5-6 overall. A coat of translucent lacquer has been applied to the baseball to prevent damage to the signatures. The lacquer has made a fingerprint, possibly Ruth’s, more visible to the naked eye. The baseball is accompanied by photomatches to newspaper articles from the time of the story as well as images from 20+ years later of an ailing Babe and a now healthy Sylvester holding this very baseball. It is further accompanied by a Full JSA LOA as well as a LOA from “Little” Johnny’s son, John Sylvester, Jr.
Auction closed on Thursday, February 6, 2014.